Oh, video game horror characters: what are you like? Name the one thing you should never do on the anniversary of a dearly departed pal if you’re a rowdy, randy teen stuck in their own fright flick. That’s right – absolutely bloody anything. Don’t pop out to the greengrocers for milk. Don’t decide tonight would be a really lovely time for a stroll down Murder Alley. And definitely don’t vacation with seven other equally rowdy, randy teens in a creepy cabin in the woods. Really, every character here deserves to be ruthlessly butchered by old Clown-Faced McGee peering out at the top there. If it’s not entirely clear by now, Until Dawn absolutely loves Saw. While its killer may be more Pennywise-meets-Michael Myers than Jigsaw, the premise of a terrorised group enduring sadistic life-or-death traps is pure ‘Cary Elwes hacking off his own foot’ 101. With the likes of Heroes’ Hayden Panettiere and Brett Dalton from Agents Of SHIELD on board, Supermassive’s horror at least has a bit of Hollywood heft behind it. Yet the game is never far from courting the schlocky side of The Force with a (perhaps deliberately) corny script and a cast of characters who really should peg it for the nearest door, rather than cower under the duvet. Actually, that last point isn’t a hypothetical. 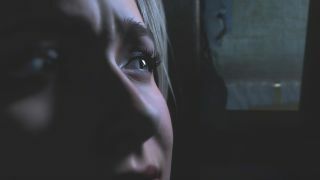 During our most recent hands-on with Until Dawn, we control a ten-minute sequence that starts with Panettiere’s Sam soaking in a tub and ends with her desperately fleeing the deranged killer while being forced to make on-the-fly fateful decisions every 20 seconds or so. Toss a lamp at the killer or flee for safety? Try to force open a door that doesn’t have a knob or tip over a wine rack to halt your pursuer? Hide from Joe Stabsalot The Third or crack him over the skull with a plank? Each fork in the road choice has to be decided on within seconds and neither option is ever instantly identifiable as more ‘right’ than the other. In many ways, Until Dawn is heavily indebted to Heavy Rain. Characters move with the same sort of turning circle that would make parallel parking the QE2 look a breeze in comparison; you can pick up and admire painstakingly detailed objects; action sequences are directed with a visual flair that’s become a David Cage staple and so on. The game also picks up the fat precipitation baton of Madison in the sense that each of the game’s eight stars/potential victims can pop it at almost any point in the story. In Heavy Rain, attempting to bump a character off was all sorts of hard. Unless you play games wearing oven mitts, the chances you’d duff up the four or five consecutive QTEs required to see Ethan and co perish were slim. That doesn’t seem to be the case here. Of our three demo playthroughs, two end with Sam meeting a grisly demise because we choose an option that sees the killer catch us. With Supermassive claiming there are no redos if you let one of the heroes cark it (the story continues on regardless), you could be looking at a scenario where it’s possible to get everyone killed within the first few hours. Of course, the demo merely offers a microcosm of the overall experience. Our guess would be there are specific pockets of action sequences where it’s possible to be killed at any time – think Alien: Isolation’s more procedurally-generated encounters – and then large parts of the game are padded out with ‘safer’ puzzles sections. This would ensure you don’t clock the end credits in 20 minutes because you mucked up a few QTEs. That’s what makes Until Dawn so fascinating: the mystery of how it will play out over several hours. We wondered the same about Alien, and that turned out pretty damn well. At any rate, the non-linear sense of choice and consequence here is ripe for scares. Now for God’s sake run!